I am so excited to finally announce a blog series. The last one I did was way back May and I know it's time to create another one. To those who are visiting my blog for the first time, the SavingsPinay Series is created for in-depth look/thorough explanation of a particular subject or topic. The first series I created was the Metrobank Week where I showed the Metrobank Direct Portal How to Enroll in Metrobank Direct Online Account and How to Pay Your FAMI Account Via Metrobank Direct. Then I created the 14 Day Productive Living Series which has a summarized version HERE. I also did a Job Interview Series which surprised me with a lot of views from SavingsPinay Readers. Getting feedback, email and even private messages in Facebook led me to pursue yet another SavingsPinay Series. What is this series anyway? Ayoko sa Utang! 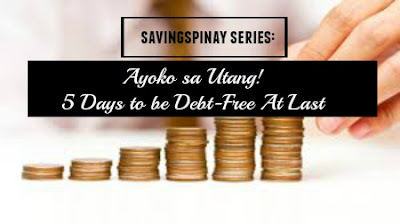 5 Days to be Debt-Free At Last is a five day-long series that will tackle the topic of Debt or Utang. Here I will give actionable items and key points on how you can finally manage to payoff your morgage and not be in a financial loop hole. Who is this SavingsPinay Series for? Day 1 (Monday) : "Gaano Kalaki ang Utang Mo?" In Day 1 we will Identify How Much Your Debt is. We will evaluate your debt whether it is a "good" debt or a "bad" debt. Just as how I give emphasis on knowing your Financial Net Worth as a primer to building financial freedom, I know exactly how determining how much your real debt is the first step to becoming debt-free. I will also share a concept called Debt-to-income Ratio that I learned through website http://www.clearpointcreditcounselingsolutions.org/ which assess the level of debt that is manageable for the income you have. Day 2 (Tuesday) : " 25 na Paraan Para Makapagbayad Ka Sa Utang"
I understand people who will tell me that how desperate they are to get out of debt but just don't know where and how to start. I pray that this series will help you. For Day 2 I will give 25 Ways To Pay Off Your Debt. These are sure ways with added tips and tricks that will truly be of aid. Day 3 (Wednesday) : "Organisadong Pagbabayad ng Utang"
Almost everyday at work I have a list of To-Do's and I find it hard to work dahil sobrang daming kalat. Just like what I share in IzzaGlino, I am very disorganized. Gusto ko nakikita ko lahat ng dapat kong gawin. However, being disorganized as you pay debt is not good. Dapat well-planned lahat and well-organized even where your bills are and the visual representation of your strategy to be debt-free. I prepared a lot of templates for this day so better check it out. I will give them for FREE para sa lahat ng nasa mailing list ko. So better SIGN-UP!!! Day 4 (Thursday) : "Tamang Pagkausap sa Pinagkaka-Utangan"
On Day 4 I will give tips and suggestions on how you can communicate to people you are in debt with. From what to say to your bank to what to your family member - lahat yan ituturo ko. Don't be afraid to communicate and negotiate with your creditor. May lakas ka ng loob na mangutang, dapat mas malakas ang loob mo na magbayad. Day 5 (Friday) : "May Forever sa Pagiging Debt-Free"
Sa last na installment of this weekly series I will give lasting habits that will make you at peace and find financial stability. The goal is be debt-free at last and not just temporarily but forever. Living in "bad" debt is frustrating. You will continue to be "one-step-forward-two-steps-back" situation. So let's move forward together. Ok? This weekly series will start on Monday, October 19 to Friday, October 23. On Saturday I will have a post-summary and will give links to more informative posts you can read para mas madami ang learning. I hope you will look forward for this SavingsPinay Series. Comment below if you are excited! WARNING: This series doesn't guarantee true success unless YOU ACT ON IT.